Atomic Sourpuss: A Godawful Small Affair: One "Space Oddity"
Whilst a quick perusal of Amazon shows that my old excuse of "Aha! 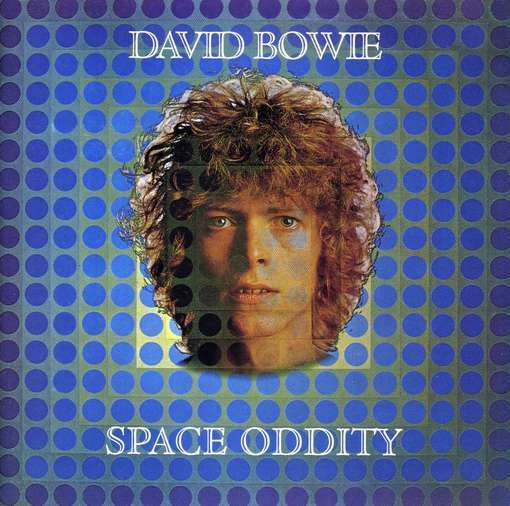 I can't possibly listen to the first David Bowie album as I can't get hold of it" is a bit moot since the formely unbeknownst to me 2010 reissue, I'm citing being skint as my new reason for skipping the first port of call on a chronological Bowie crawl and heading straight for this one. A confession, dear reader: this is not my first walk down this road. Many are the times I have dug out the Bowie stack and listened to them backwards, forwards and in most every order imaginable. On those occasions I have always thought of this album as a bit of a chore; a bump in the road, and certainly not the last, but no cause for celebration. But this time - well actually it would largely be the same. Sorry. That's not to say it lacks its moments, not least "Space Oddity" itself; a song so universally known that it is practically hard-wired into generations of people from all walks of life. It's a rare example of a song with an absolute ton of instruments in it, all slathered in effects, with rapid changes between many sections that still didn't sound cluttered and remained appealling enough to top the chart. Outside of the obvious, "Wild Eyed Boy From Freecloud" is a spectacular epic with full orchestration, probably best remembered nowadays for being on the setlist at Ziggy's last show, and "Unwashed And Somewhat Slightly Dazed", which almost seems like a prototype for the next few albums with its hollering and howling and electricity and whatnot. Other than that, it's all a bit forgettable. I'm sat here looking at the tracklisting and I couldn't tell you what "Janine", "Cygnet Committee" or "Letter To Hermione" sound like, but the phrase 'wishy-washy' springs to mind. "Don't Sit Down" is throwaway, and if I have to listen to "Memory Of A Free Festival" again I'll bust that bloody Sun Machine up. Bust it up reeeeeal nice. Ultimately I do feel bad complaining about an album that was released outside of my jurisdiction, one to which I have no living cultural context to compare, and one which spends most of its time in a vaguely folkish, slightly patchouli-scented singer-songwriter format that is just not something I can get down with, but... Well, there's my opinion, right there. Having said that I'm hearing more good in this album than I have before, and I'm full of excitement about the listening to come. Join us next time AS SUPERGODS DIE!!!!!!! Oh, by jingo!